Worthing Football Club boss Adam Hinshelwood says it will be far from an easy ride when his side travel to Bedford Town in the FA Trophy third qualifying round tomorrow. Bedford, who are sixth in Evo-Stik League South Division 1 Central, had their 13-game unbeaten run ended on Tuesday when they lost 1-0 at Peterborough Sports. Worthing are flying high themselves, sitting third in the Bostik League Premier Division, but could be without nine players for the game. Alex Parsons and Darren Budd are both suspended after collecting two bookings in the competition, Reece Meekums and Zack Newton are both unavailable owing to the loan arrangements with their parent clubs and Aarran Racine, Alfie Young, Lucas Covolan and Ollie Pearce are all set to miss out through injury. Ricky Aguiar is also a doubt after picking up a knock on Tuesday but Hinshelwood hopes defender Joel Colbran will be fit to return. He said: “It’s going to be a tough test. I spoke to someone at Chipstead who gave me a bit of a rundown on how Bedford play and he said they’re a good side. 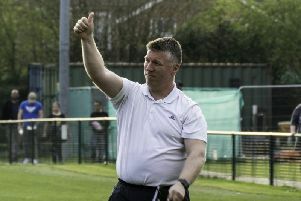 “Anyone who is thinking it’s going to be a day out watching Worthing get a nice, easy win is going to be in for a shock. “It’s going to be a tough game. We’ve had a few tricky away games in cup competitions this season and we’re not expecting this to be any different. If Saturday’s match is drawn, the replay will be at Woodside Road on Tuesday (7.45pm). If the game is decided, Worthing will be away to Brightlingsea Regent in the league on Tuesday.